Good morning, everyone. 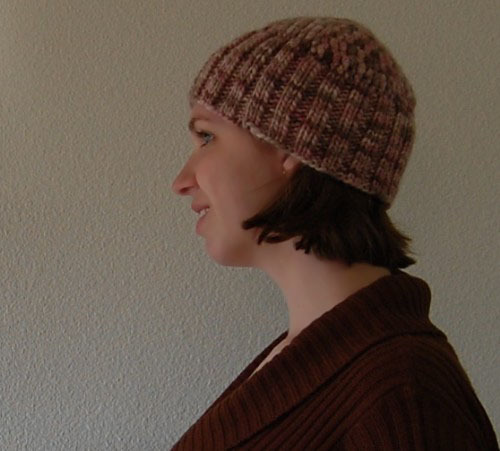 First order of business – there was an error in the pattern for the Nottingham hat that has been corrected. If you’ve downloaded a copy of the pattern before today, please go download the new one for a more fun time when you’re trying to work the cable. In other news, several hundred miles north of Texas it apparently gets quite cold in late November. Ha ha. I believe it was in the 60s when I was checking the weather there before our trip – I packed a few warm things I had made, more as an opportunity to wear them than because I thought I would need them. After our trip to Colorado, of course, I knew it would be chilly and made sure that all of us had long sleeves, long pants, and jackets. I really should have thought of gloves. And hats. And scarves. Oh, yes. Fortunately, I brought yarn and implements with me (of course) and was able to make myself a hat when the temperature dropped below freezing. It’s a hybrid, a combination of knitting and crochet worked from the top down. I think it turned out pretty well, using up one skein of Bernat Felting that I picked up in a pretty color (the color is more accurate in the second photo). Since it’s intended for felting (loosely spun single ply bulky wool), I worked it more tightly than I would have a sturdier yarn. It’s nice! It’s fast! Rnd 1: Ch 2, make 8 hdc in 2nd ch from hook. Rnd 2: [k2, p1] around. Rnd 4 – end: [k2, p2] around. Work ribbing until about 4 yds remain, or desired length is reached. Bind off in rib for a neater edge, weave in ends. I blocked my hat lengthwise only to get a little more length. Apparently if you block ribbing horizontally it loses its ‘ribbiness’ and doesn’t hug as well. Made for my own adult sized head. So there’s one thing I did on my Thanksgiving vacation. It’s December now! Ack! What will I do for Christmas? That is really cute! I hope I can get my Christmas crocheting done. I haven’t started on about 4 items I need to make and most of them need to be mailed as well!!! oof…I’ve got SO MUCH to do the next two weeks it’s not funny! Ooooo, that is so cute! I’ve been sewing like a mad women to get Christmas eve PJs done in time. Aaaahh. I like your work! The hat is so cute! I enjoy doing crochet,knitting,counted cross stitch and etc. I started on gifts this year like birthdays,anniversaries and etc…. Wow…this is a very nice hat, and something that I would like to crochet/knit. 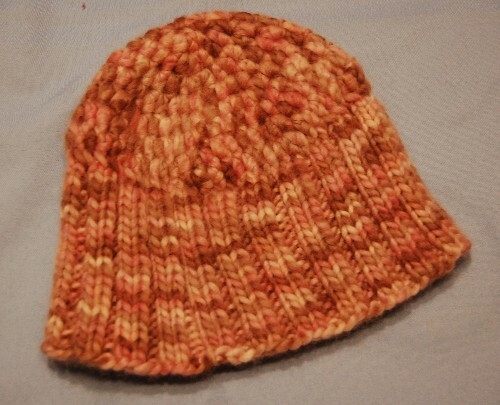 But I would like to know if I can use a straight needle on this hat instead have double pointed needles? I’m sort of a beginner, and have never used dpn’s. Hi, Lorraine. When you use double-pointed needles, it creates a tube of fabric instead of a flat piece. Sometimes you can substitute straight needles, but I think it would be very difficult to in this case because the crocheted crown means that when you start knitting you are already knitting around! This might be a good pattern to try double-points for the first time, as one of the most difficult things about double points (to me) is casting on and setting the stitches up correctly. Since the crown of the hat will be crocheted, you won’t get twisted around and it will be much more like starting in the middle, which is always easier. I hope this helps! Great looking hat. I am anxious to begin; crocheting crown is a great idea; it should be easier than bottom to top. Thanks for the great pattern. You put a smile on my face. And i smiled so much that tears came to my eyes. So you are having twin boys to join already two boys. 4 Boys oh my. But is sounds like you will enjoy them so much. and you can keep them in these nice hats. Wishing you lots of energy to keep up. I love your patterns. And you for all that you do for your family, and us! I live in Iowa, and enjoy making items for my grandchildren, and children. I also am LDS.